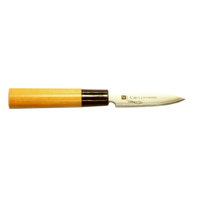 This 3.5" Paring Knife from Wusthof's Culinar line is an excellent multi-purpose tool for mincing, chopping, or cutting vegetables, fruit, and meat. 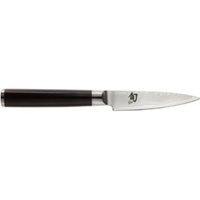 The Culinar line are precision-forged knives with stainless-steel handles. An integral part of the knife's construction, the bolster provides balance, safety, heft and authority. In Solingen Germany, each piece is hand-forged in 38 manufacturing steps by skilled craftsmen. Lifetime warranty. Kasumi Titanium Coated knives are Japanese style blades with black plastic handles.